Setting up a new office space can put a large financial strain on your small business. By choosing virtual office companies offer easy monthly plans that can accommodate just about any budget. Paying costs like utility bills and rent on a traditional office space can put a huge strain on your profitability, which could result in you closing your doors due to lack of funds. 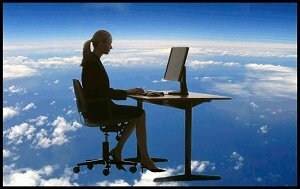 By using a virtual office, you can increase the efficiency of your business substantially. Our virtual facilities offer a receptionist that can handle all of your calls from customers. By taking the stress of handling phone calls off of you, you will be able to focus more on growing your business and keeping your customers happy. You may also be able to get a virtual assistant that can answer emails and handle mundane details of your business that you just do not have time for. Being able to focus your energy on growth will make it possible to expand your business beyond your wildest dreams. Building a small business from the ground up is a very risky venture for all involved. By choosing a virtual office, you will avoid being tied to an office space in case you have to downsize or completely go out of business. No one wants to fail, but having a backup plan is very important when it comes to your small business. There are so many options to choose from when you are looking for virtual office services. The best thing to do is to evaluate each facility thoroughly so you can make an informed decision. Many virtual facilities will provide you with a detailed list of amenities so look over each one and see which facility offers the most perks for the least amount of money. Call Weston Town Center Executive Suites today for more information regarding virtual office space and how it can help your business.